FILE PHOTO: Myanmar's State Counsellor Aung San Suu Kyi gives a speech at the Swedish parliament in Stockholm, Sweden June 13, 2017. DHAKA/SHAMLAPUR, Bangladesh - Myanmar’s Aung San Suu Kyi on Wednesday blamed “terrorists” for “a huge iceberg of misinformation” on the violence in Rakhine state but made no mention of the nearly 125,000 Rohingya Muslims who have fled over the border to Bangladesh since Aug. 25. The leader of the Buddhist-majority country has come under pressure from countries with Muslim populations over the crisis, and on Tuesday U.N. Secretary-General Antonio Guterres warned of the risk of ethnic cleansing and regional destabilization. In a rare letter expressing concern that the violence that has raged for nearly two weeks in the northeastern state could spiral into a “humanitarian catastrophe”, Guterres urged the U.N. Security Council to press for restraint and calm. a population of roughly 1.1 million he says are facing genocide. In a statement issued by her office on Facebook, Suu Kyi said the government had “already started defending all the people in Rakhine in the best way possible” and warned against misinformation that could mar relations with other countries. She referred to Tweets of images of killings posted by Turkey’s deputy prime minister that he later deleted because they were not even from Myanmar. “She said that kind of fake information which was inflicted on the deputy prime minister was simply the tip of a huge iceberg of misinformation calculated to create a lot of problems between different countries and with the aim of promoting the interests of the terrorists,” the social media statement said. The latest violence in Rakhine state began 12 days ago when Rohingya insurgents attacked dozens of police posts and an army base. The ensuing clashes and a military counter-offensive have killed at least 400 people and triggered the exodus of villagers to Bangladesh. 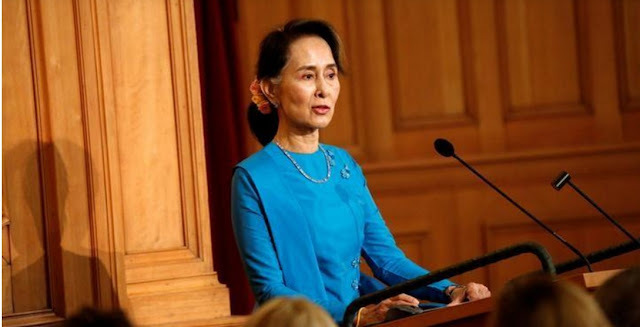 Suu Kyi has been accused by Western critics of not speaking out for the minority that has long complained of persecution, and some have called for the Nobel Peace Prize she won in 1991 as a champion of democracy to be revoked. Myanmar officials blame Rohingya militants for the burning of homes and civilian deaths. But rights monitors and Rohingya fleeing to neighboring Bangladesh say the Myanmar army is trying to force them out with a campaign of arson and killings. The new arrivals - many sick or wounded - have strained the resources of aid agencies and communities already helping hundreds of thousands of refugees from previous spasms of violence in Myanmar. Vivian Tan, a spokeswoman for the U.N. refugee agency, UNHCR, said one camp in Bangladesh, Kutupalong, had reached “full capacity” and resources at others were being stretched. The International Organization for Migration said humanitarian assistance needed to increase urgently and that it and partner agencies had an immediate funding gap of $18 million over the next three months to boost lifesaving services for the new arrivals. The latest estimate of the numbers that have crossed into Bangladesh, based on calculations by U.N. workers, is 123,600. That takes to about 210,000 the number of Rohingya who have sought refuge in Bangladesh since last October, when Rohingya insurgents staged smaller attacks on security posts, triggering a major Myanmar army counter-offensive. Myanmar’s Aung San Suu Kyi on Wednesday blamed “terrorists” for “a huge iceberg of misinformation” on the violence in Rakhine state but made no mention of the nearly 125,000 Rohingya Muslims who have fled over the border to Bangladesh since Aug. 25.